I don't understand how stocks work but I'm hoping someone can explain it to me given my short example here. So on Monday, I purchased 2 stocks priced at $2.50 each, using an app on iOS called Robinhood. It advertises itself as the first free stock exchange, so I took it at its word. On Tuesday, I sold those stocks for $2.48 each. So you would think that I would only lose 4 cents correct? No. I lost 6 cents. Why? I thought stocks were just simple math. Buy low, sell high (obviously not in this case), but why does 2x2=6 in the stock market? 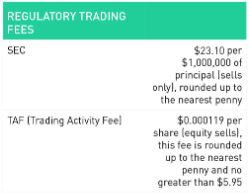 So if you literally bought two shares, then the SEC added one penny in fees and FINRA added one penny as a "Trading Activity Fee"
Note that there are several other fees on their schedule that may not apply to you. If you had bought 100 shares instead, your total fees would have still been only 2 cents, but you would have lost $4 on the trade. So the fees are minuscule when you start doing larger orders. However, That should not discourage you from experimenting and learning. I'd rather pay 2 cents in fees on a 4 cent loss than 2 cents in fees on a $400 loss. Just chalk it up to the cost of experience. There is a misunderstanding somewhere that your question didn't illuminate. You should have lost $0.04 as you say. Assuming the prices are correct the missing $0.02 aren't covered by a reasonable interpretations of the Robinhood fees schedule. The total fee rate is 0.002329% or 0.00002329*the price of the trade. With you trades totaling around $11, the fee would be ~0.000256 or ~1/40 of a penny. The answer is probably that they charge $0.01 for any fraction of a penny. It's difficult to explain as anything other than avarice, so I won't try. Not the answer you're looking for? Browse other questions tagged stocks investing or ask your own question. Is there any advantage or strategy in buying/investing shares of many companies spread-out vs. fewer/more selective ones all-in? Why does short selling require borrowing? Is foreign stock considered more risky than local stock and why? Why do Big Stock Players trade more in the last few minutes of the trading day? What is the difference between quote data, trade data and pricing data in stock market?